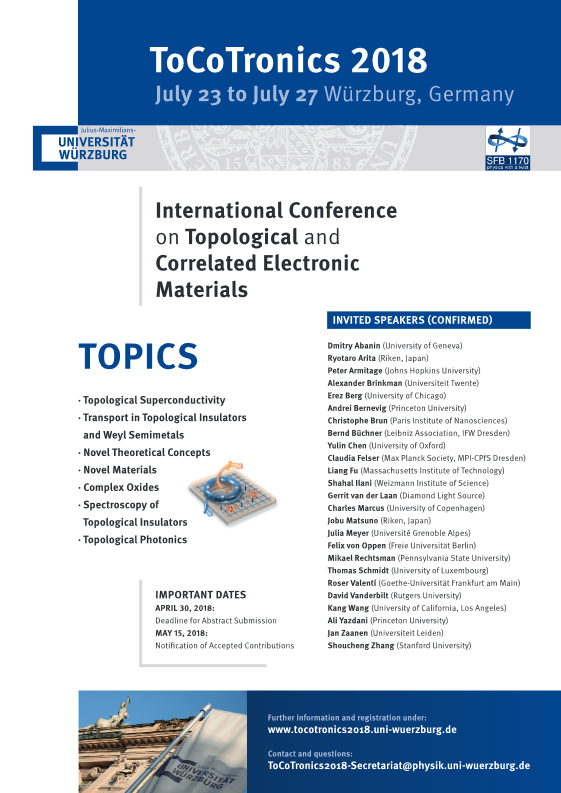 The four-day conference on Topological and Correlated Electronic Materials (ToCoTronics2018) took place from July 23 to July 27, 2018 in Würzburg, Germany. The aim of this conference was to bring together experimentalists and theorists working for example on topological insulators and superconductors, Weyl semimetals, complex oxides, topological photonics, and novel theoretical concepts and materials. We did not authorize any third party company (travel organization, hotel, call center, etc.) to contact participants and invited speakers for making room reservations, shuttle services, etc. We have heard from colleagues attending other conferences of the following scam: they have been contacted by somebody pretending to represent the conference organizer, asking for credit card information to book a hotel room etc. In order to reserve a room, please contact the hotel directly. Final registration deadline: July 13, 2018. If you want to pay the registration fee by bank transfer, please do so before July 13. If this is not possible, please pay at the conference itself, on Tuesday, July 24, or Wednesday, July 25, between 8:30 and 11:00. Poster setup: Please prepare your poster in A0 format in portrait orientation, i.e. 84 cm (width) x 118 cm (height). The conference was hosted by the Sonderforschungsbereich SFB 1170 Topological and Correlated Electronics at Surfaces and Interfaces (ToCoTronics).